Panachikkadu Dakshina Mookambika Narathri Festival will start on 10th October and will last till October 19th, 2018. Mookambika Temple Panachikkadu Vidyarambham ceremony starts from early morning after the Saraswathy Pooja on October 19, Friday, 2018. 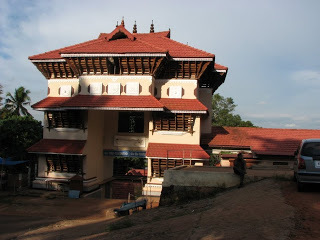 Panachikkadu Saraswathi temple is known as Dakshina Mookambi, It is one of the famous Saraswathi temple in Kerala celebrating Vidyarambham for children. Distance from Kottayam to Panachikkadu Saraswathi Temple is about 11 km. Railway Station: Chingavanam Town Railway Station to Panachikkadu Dashina Mookambika Saraswathi Temple is 4 km. Airport: Cochin International Airport, about 76 km from Kottayam.